Athena Smartcard Solutions is introducing the ASEDrive IIIe USB Bio KB, a combined biometric smart card keyboard which incorporates the UPEK® TouchChip® TCS2 fingerprint sensor, enabling strong user authentication and password-free logon to PCs. 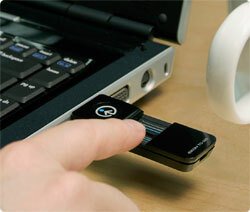 The USB keyboard also incorporates an ASEDrive Smart Card reader for multi-factor authentication. The keyboard and smart card reader comply with the PC/SC standards, Windows 2000, XP and Vista, Linux and MAC. The UPEK TCS2 area sensor is mounted for easy user access and supports Bio API and Precise Biometrics’ Match-on-Card technology for strong multi-factor authentication. ASEDrive IIIe USB Bio KB is the latest addition to Athena’s smart card reader family. The keyboard offers ISO7816 smart card support, Bio API fingerprint sensor support for Match-on-Card functionality, secure PIN entry & flash upgradeability. Tokyo, Japan, June 25, 2007–Athena Smartcard Solutions is introducing the ASEDrive IIIe USB Bio KB, a combined biometric smart card keyboard which incorporates the UPEK® TouchChip® TCS2 fingerprint sensor, enabling strong user authentication and password-free logon to PCs. Security is further enhanced by the incorporation of the ASEDrive Smart Card reader for multi-factor authentication in this new USB keyboard. The keyboard and smart card reader comply with the PC/SC standards, Windows 2000, XP and Vista, Linux and MAC. The UPEK TCS2 area sensor is mounted for easy user access and supports Bio API and Precise Biometrics’ Match-on-Card technology for strong multi-factor authentication. The ASEDrive IIIe Bio keyboard offers flash upgradeability, essential in keyboard smart card readers so that future updates to smart card technology will not require the replacement of the keyboard. Offered in several languages, ASEDrive IIIe Bio KB smart card keyboards are manufactured to the highest quality standards. They are thoroughly tested to support all major smart cards in the market. The ASEDrive readers have passed the Microsoft Hardware Quality Labs tests and are eligible for the ‘Designed for Windows XP’ & “Vista” logos. Combined with Athena’s ASECard Crypto smart card and the bio middleware, customers can benefit from the highest security available with 2 or 3 factor authentication for logical access. Athena Smartcard Solutions, one of the industry’s fastest growing vendors, is a leading provider of smart cards, tokens, smart card readers, combined keyboards and smart card management systems – protecting computer networks – and an innovative supplier of cards and operating systems for banking and GSM. Athena’s offices in the US, Europe, and Asia serve customers worldwide including some of the world’s leading banks, manufactures, GSM operators and Government organizations. The company’s dedicated engineering, sales, and support staff has over 20 years’ experience in smart card and security technology including some of the original innovators and developers of Java Card and inventors of key technologies of the MULTOS operating system. Athena’s products include contact and dual interface open platform and file system based cryptographic smart cards for Windows Authentication, PIV, CNS/CIE, JICSAP, GSM, and EMV. The Athena ASEDrive line of smart card readers includes high performance USB desktop, internal, keyboard and biometric smart card keyboard readers. Athena’s cryptographic middleware solutions including the ASECard Crypto Toolkit with support for all major operating systems, and through the Athena CMS, our customers enjoy smart card life-cycle management solutions for contact and contactless cards. For more information, please visit http://www.athena-scs.com.